I don’t know how you see the Holy Spirit in your church tradition but this we can’t argue over; Pentecost is the church’s birthday! And celebrating Pentecost or the church’s birthday is important because, whether or not we like it or find it hard to believe He would do something so risky, the church is God’s prime instrument for reaching a desperately needy world. Celebrating Pentecost, the church’s birthday. It’s also the most dramatic appearance that the Holy Spirit makes in the Bible. However you see the Holy Spirit, Pentecost is the day when 11 confused, terrified and, let’s be honest here, traumatised Disciples, go from hiding in a locked room in fear to bursting out into the bustle of Jerusalem and starting, right there, to change the world. Surely we all need some of that power and courage as we go into life? It’s true for us as tired, overextended parents and it’s just as true for our kids if they’re heading into environments like school. I could identify with that! A helpful sermon illustration came to mind. “Did you know there are seven billion people in the world?” I asked her. She gaped. That’s an inconceivable number when you’re four. This mystery seemed to make sense to her. Emmanuel, God with us, is also the Holy Spirit, God in us. So, how can we mark Pentecost? I’ve got some ideas below for older kids but with my smaller children, I started last year, as usual, with reading the story in the Beginner’s Bible. 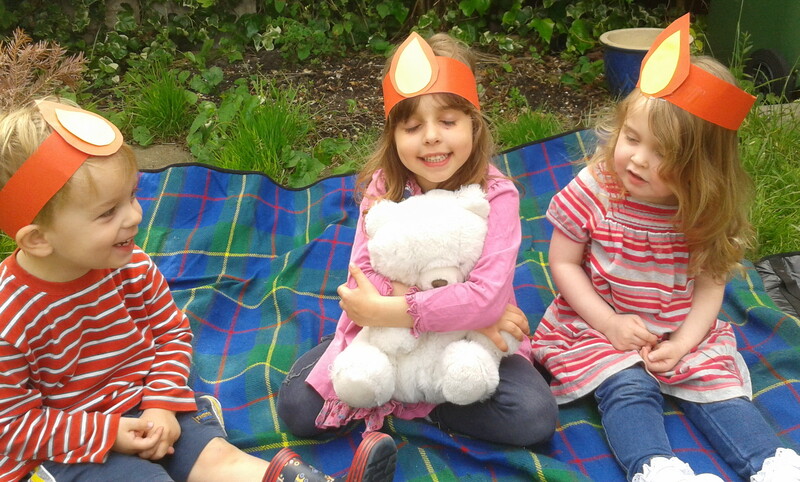 We were, at the time, very, very tired, so we invited just one other family over for our first Pentecost party. It was really low key. They were aged 2 – 4 so that was just fine! Low key is good. Non stressed-out parents is good. 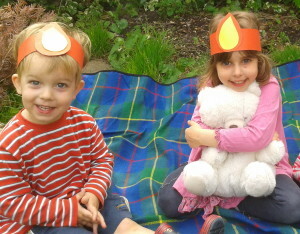 First we made some flame hats to look like the disciples. I think you can see how we made them and how much fun we had. I just winged it with the flame patterns. The front, smaller flame was yellow and the back one the same red as the band I made, also out of card. Then we went in the garden with some pinwheels which I’d bought and talked about how you can’t see the wind but can see what it does and it’s the same with the Holy Spirit. For older children, you could go fly a kite or make windsocks. Finally, for snack, we had Pentecost muffins. They were very, very easy and you can short-cut them still further. 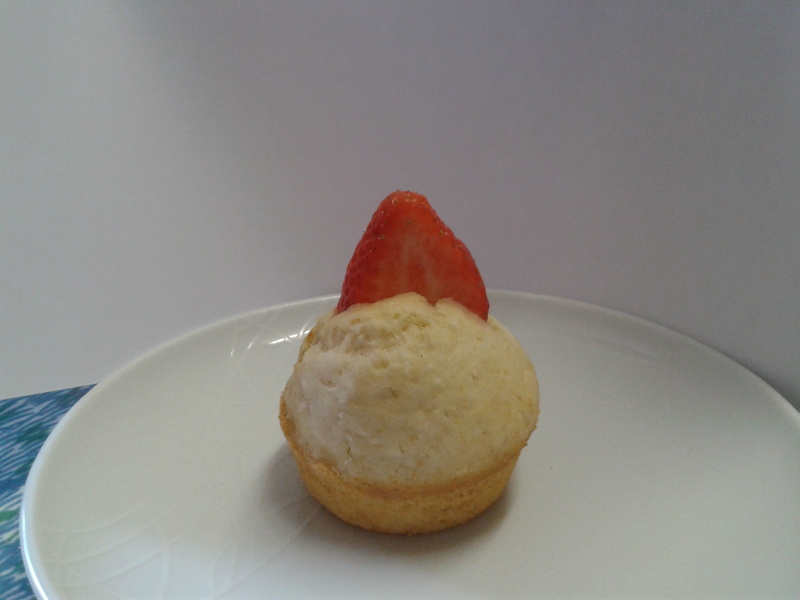 I made some very basic muffins with white flour – you could also buy muffins or fairy cakes – cut a slit in the top and inserted some sliced strawberries to look like flames. 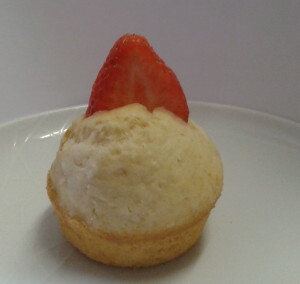 If your children like icing, you could stick the strawberries in some thick, white buttercream or cupcake icing. As the kids get older and we (hopefully) get a little more sleep, I’d like to make much more of Pentecost. It can be a little lack-lustre in some churches, after all. It would be fun to decorate the house in the Pentecostal colours of red and white and maybe leave our family’s birthday bunting up another week after my own birthday. We could bake a birthday cake with 12 candles on it , one for each apostle or eat a nine-fruit salad symbolising the fruits of the Spirit. There are many amazing crafts and ways to decorate your home if that is your thing, including some that are ready to make straight away if you have a printer. Michelle Guinness also suggests making food that is red and white. Funnily enough, dairy foods are traditional at Pentecost in the Jewish tradition so how about a strawberry cheesecake or, to start with, tomato and mozzarella salad? You could also try a white-iced red velvet cake or even spaghetti Bolognese! Just make it festive – it’s a birthday! Finally, a great resource for teaching under 7s about what the fruits of the spirit look like is the retro but beautifully produced Music Machine album which I wrote about last year. My children have heard this hundreds of times (by request) and it so good! 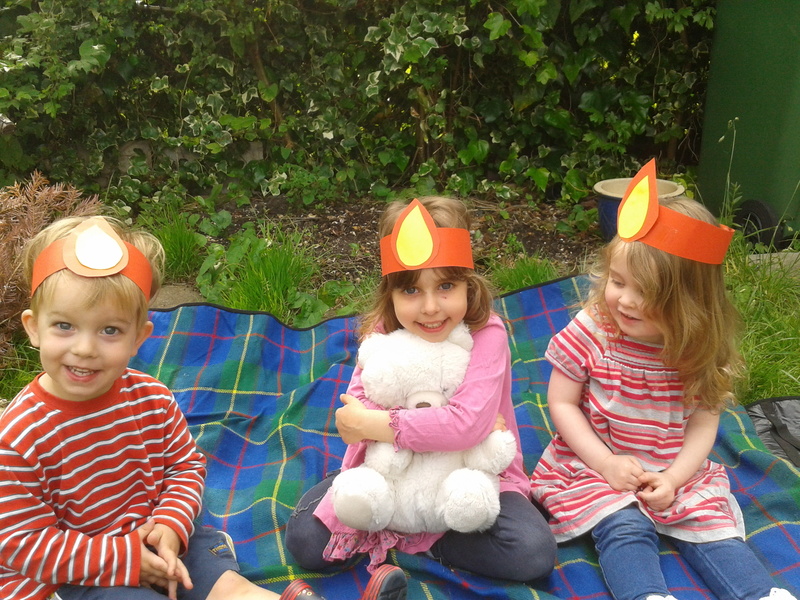 So, how do your family explain the Holy Spirit to your children and how do you celebrate Pentecost?